Pure unveils Orla Kiely designer edition of Evoke Mio | What Hi-Fi? 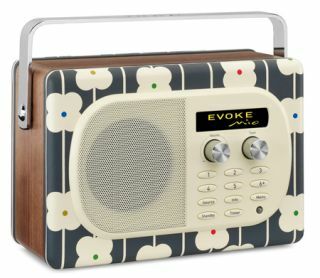 Pure has released a limited edition version of its Evoke Mio radio with the designer Orla Kiely. The Abacus Flower edition is named after one of the designer's famous prints, which adorns the radio in slate grey. It's the second version of an Evoke Mio that Pure has produced with Orla Kiely, and will be available exclusively from John Lewis. The radio itself remains the same as any other Evoke Mio, with DAB and FM tuners, an auxiliarly input for connecting an iPod/music player and an OLED display. There's also the option to add a Pure ChargePAK for 24 hours of portable power. The Pure Evoke Mio by Orla Kiely - Abacus Flower Edition will be available from John Lewis at the end of August, priced £150.